were photographed by Mr. Wagih Rizk on Saturday, April 13, 1968 at around 3:40 am. and affirmed that there was no possibility of photo-montage. On Tuesday, June 27, 1967, I was riding my car from downtown on my way back to Zeitoun where I live, when beside Saray El-Koba Station, a child playing football and another one running after him suddenly appeared in front of me. The distance between my car and the second child was not more than one meter. There was no way; I was definitely going to strike him, even if I had braked forcibly. The only thing I could do was to steer the car away from the child trying to avoid him. So with all my force, I turned to the left; the car rolled on its side and I passed out. After about a minute, I was awake to find myself on the ground with all of my left upper limb under the car. I didn't feel pain at first, but when I tried to pull out my hand from under the car, I felt severe pain in my elbow. I looked at my painful elbow and saw what caused me to pass out again. Nothing was tying my forearm to my arm except for a torn flap of skin through which only two vessels were appearing intact... The rest of the vessels were cut and bleeding on the ground. I don't know how I thought quickly that if people come and try to pull me from under the car, my forearm will be definitely cut. I still don't know how I managed to support myself on my right arm and put my feet under the car, pulling it up with all my force until I felt the pressure over my left arm decrease and was able to withdraw my arm slowly, then I left the car come back to its place away from me and for the third time, I passed out. This time I was awake to find myself at Mansheyat El-Bakry hospital with doctors, nurses and many faces in front of me. I could only see their eyes under the light of the spotlights directed over my head. It was midnight and I was in the operating theatre and only opened my eyes once to find something heavy, the anaesthesia mask, put rapidly over my mouth and nose and again I was unconscious. I recovered from anaesthesia to find my left upper limb wrapped in gauze and a nurse beside me. When I asked her what happened, she told me how people gathered around my car and a lady wrapped my arm with her blouse to stop the severe bleeding until the ambulance came to transport me to the hospital where I was operated upon by Dr. Zarif Beshara. The next day (Wednesday, June 28, 1967), an X-ray was done and it revealed that the operation failed and the arm was not in its proper position. Dr. Samir Farag decided to do a second operation immediately. I was operated upon on the next day and for the second time the operation failed. Dr. Ali Rady put my arm in a plaster cast. Months elapsed and the plaster cast was removed and replaced one time after the other for nine times over a period of three months. Finally, doctors decided that they have done all what they could and that my left limb was destined to remain motionless beside me, and suffices that it is in its place and was not amputated. I left the hospital surrendering to my fate. "All tissues, nerves and tendons that join your arm were cut and the bones have compound fractures and consequently you will never be able to move your left forearm and hand again... Your condition was severe and you have to thank God for being in such state now." I then went to seek the advise of another famous orthopaedic surgeon, Dr. Abdel Hay El-Sharkawy. After doing an X-ray and in spite of the fact that he didn't ever meet the previous doctor, he repeated the same words that the previous doctor had said and he added: "I am sorry. I have no treatment for you now. There may be a new treatment in the future for your condition, so come again after two or three years!" I left him and surrendered to my fate, working with only one hand and loosing the other completely. I trained myself on this, and as a photographer, I adapted myself to do my work with only one hand. That's God's will. On April 9, 1968, I was shaken by the news of the apparitions of the Blessed Virgin Mary at Zeitoun and so I went to see Her. 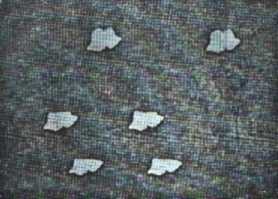 That night at 2:45 am, I saw Her in the form of radiating light like clouds. The light was very strong, so strong that the eye couldn't bear it, and was seen near the cross over the small eastern dome. The apparition was awesome... Reverence and fear filled me like an electric shock. I returned home. I couldn't control my thoughts or sleep in spite of the fact that I didn't sleep all that night to witness the apparition. I had a bizarre thought: I wanted to take photos of the Blessed Virgin and Her miraculous apparitions. Why not? I didn't hesitate. The next day I went to Virgin Mary's Church at Zeitoun and took my camera with me. I fixed the camera on the roof of the garage in front of the church's domes, but I couldn't take any photo; She didn't appear that night. On the following day, I tried again. This time the Virgin appeared. Although the camera was ready, I stood in astonishment and couldn't move like all people around me. Everyone in the crowd assumed a certain pose: you could see one covering his eyes with his hand, another falling on the ground, a third hiding his face behind the one standing in front of him, and so on... However, I couldn't remember my own pose. On April 13, I was determined not to let the opportunity escape anymore. At 3:40 am, the Blessed Virgin appeared. And very quickly, I captured the photo... Our Lady is still appearing in front of me... So I took a second photo... And you know, from what you have read in newspapers, the technical aspects and the way these two photos were captured... But what you don't know is the spiritual aspect. I returned home thinking of what happened and waiting impatiently until the morning to know the results of processing the photos. I recalled in my mind every moment that passed while the Virgin was appearing in front of me. Suddenly, I stood out of my bed. Yes I did it! But I couldn't remember exactly... But no, I could actually remember! I forgot while I was looking at the apparition of the Blessed Virgin the fact that when I captured the first photo quickly, I used my left hand! Yes my left hand... The hand five doctors, some of them are among the most famous surgeons in Egypt, said was hopeless and will never move again... The Blessed Virgin has miraculously healed this hand! I started to move my left hand, up, down, to my side and to rotate and wave it in the air while extended... I was cured... completely cured once the Virgin appeared. And from this day the camera never leaves me, and the camera and I never leave Zeitoun. 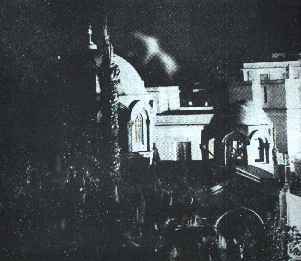 Among the many photos photographed by Mr. Wagih Rizk, besides the main photo (see top of this page), are photos of the Blessed Virgin Mary carrying the Child Jesus Christ and kneeling in reverence in front of the cross on the church roof, and of the Virgin appearing in a bust over the north eastern dome, and a photo of Her appearing over the central dome accompanied by another Person who may be our Lord Jesus Christ, an angel, or one of the saints, and another photo showing a formation of six luminous celestial beings taking the shape of big and extremely white doves. Mr. Wagih Rizk never sold these photos or charged those who published them for any sum of money. He said that if money was his purpose, he wouldn't have succeeded in capturing any of these photos. our Lord Jesus Christ, an angel, or one of the saints. 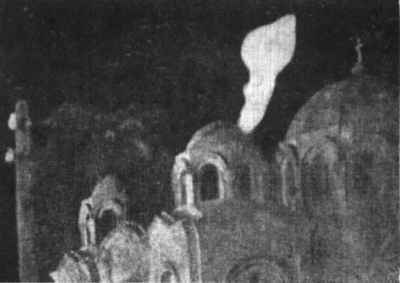 Photographed by Mr. Wagih Rizk at 2:35 am on Monday, May 6, 1968.
or a big dove flying over the church domes. 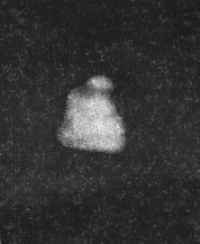 Photographed by Mr. Wagih Rizk at 2:45 am on Thursday, May 9, 1968.
over the north eastern dome of the church. Photographed by Mr. Wagih Rizk at 4:30 am on Tuesday, May 21, 1968. Photographed by Mr. Wagih Rizk at 3:15 am on Saturday, May 25, 1968. Photographed by Mr. Wagih Rizk at 2:35 am on Monday, June 10, 1968.